The sabre, or broad-sword, is a single broad-bladed weapon a little like a machete. We mostly use wooden models for the T’ai Chi forms we practice, simply because they are cheaper than metal models. 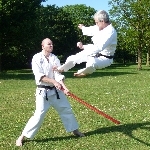 The forms encourage the use of hips and the co-ordination of hands and feet, as well as how to use the momentum of the sabre to power its movement. 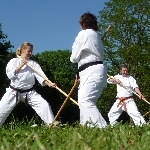 The bokken we use is a training sword, or suburitõ, and is heavier than a normal bokken. Suburitõ are used for practicing suburi. It’s weight makes the bokken ideal for strengthening and conditioning, as well as the development of spirit and focus. For sparring and where weapons clash, a bamboo shinai is used instead. A bo, or staff, usually fashioned from a single stalk of bamboo. 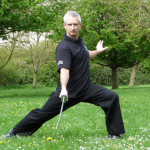 Being bamboo, when wielding the bo with sharp movements of hips and hands you will see the end whipping back and forth. In order to achieve this you must move the body and the bo as one. We practise both Chinese T’ai Chi forms and Japanese kata. Both are practised as though the bo is an extension of our limbs, and can also be done empty-handed.